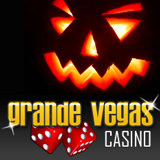 Grande Vegas Casino is being frighteningly generous with casino bonuses during their Halloween Madness celebrations. Three lucky players will get every penny they deposit in October refunded! They'll be randomly chosen at the end of October and will receive a no-deposit cash back casino bonus. Many more will receive surprise bonuses when they check their casino message centers. Grande Vegas surprised players with notes in their message center about deposit bonuses and cash-back bonuses several times in September. They’re not saying when, but they will be making more surprise announcements in October including one for an add-on tournament. Since players have just 24 hours to respond to these messages they’re advised to continue checking their message center inboxes frequently. There are more than 300 casino games to choose from at Grande Vegas Casino, including slots, blackjack and roulette. Several slot machines with progressive jackpots over a million dollars are among the most popular. Someone playing Jackpot Pinatas could win over $1.7 million. On Aztec’s Millions the progressive jackpot is currently over $1.2 million. The Midlife Crisis/Shopping Spree jackpot is at $1.1 million and Cleopatra’s Gold is over a quarter million. A great surprise for some lucky people this month!